Cork is not a new fad, it can be traced back to ancient Egypt. In the 18th century, Dom Perignon used cork for champagne making it a significant discovery that would lead to many other uses of cork. Cork is very lightweight and low in density. It is very durable. It is often used in public buildings because of its durability. Cork is often used in libraries and churches because of its sound absorption qualities. Cork is more forgiving on your joints than hard surface floors because of the millions of air filled cells. This is what makes cork a great choice for kids playrooms, retail or other places where people are on their feet for hours at a time. Cork is also a great insulator because it reduces the transmission of sound, vibration and heat. Air is sealed in each of the cells insulating from the adjacent cells with a moisture resistant, waxy like substance. A cubic cm of the honeycombed shaped cork cell contains about 40 million hexagonal cells. The cells are composed of almost 90% of an air like gas. This makes cork flooring a great choice for recording studios and other places where sound needs to be kept to a minimum. 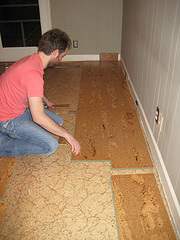 Cork also reduces heat loss in rooms because of the encapsulated air cells. Unlike ceramic tile, it never gets cold on your feet. It maintains an even temperature that is not too warm or too cold. A substance called Suberin that naturally occurs in cork makes it resistant to bugs, mold, mites and termites. Because of this substance, cork also will not rot. Also because of this substance, cork is naturally a fire inhibitor. Upon combustion, cork does not release any toxic gasses. People with allergies are big fans of cork floors because of their hypoallergenic properties. 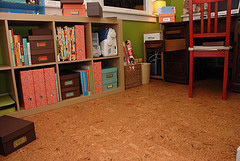 Cork floors do not absorb dust and are very useful for people with asthma and respiratory diseases. Cork is also very resilient. Because of those same air cells that help with heat loss, sound absorption and softness cork can return to its original shape even when exposed to heavy weight and pressure. This is an advantage over hardwood flooring. An environmentally sound choice for flooring. Cork comes unfinished and pre-finished. There are many different types of finishes that are both harmful and safe for the environment. In wet areas like bathrooms and kitchens, most manufacturers recommend a water based polyurethane sealant. These floors can be glueless and clicked together for installation, pre-glued or glued as long as the subfloor is dry and level. Some floors have beveled edges that allow the floor to naturally expand and contract without buckling. Cork comes in tile shapes, plank shapes and mosaics. Cork comes in many different patters from very small tight patterns to wide abstract patterns. Colors range from natural cork color to vibrant, bold colors. Burning the cork before it is compressed in combination with varying granule sizes creates the different colors and patterns that make cork such a unique product. 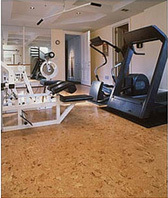 Cork is very easy to maintain especially with polyurethane coatings. Cork will fade if exposed to direct sunlight. Furniture and flooring should be moved periodically to even out the fading from sun and UV exposure. It will also react to humidity and moisture. Humidity should be maintained at 50-60%. Cork floors should be swept and vacuumed often to avoid the build up of dirt. Dirt can scratch the finish. Do not use abrasive cleaners or solvents, especially those that contain glycerin. These products can harm the finish making it impossible to refinish. A neutral PH detergent (PH of 6-8) should be used to clean cork floors either with a wrung out sponge or misted over the floor and damp mopped. Chairs with casters should have minimum 2” casters. Mats should be used under chairs with casters to protect the finish from becoming dull. Furniture or chair feet should sit on wide coasters to prevent excessive indentation. If damaged, cork can be repaired.